Samira Quraishy is a writer and activist based in the UK, and an analyst at Middle East Monitor. 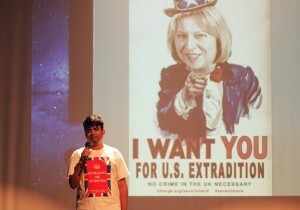 On Saturday, hundreds of human rights activists, politicians, artists and concerned citizens gathered in London to highlight the plight of Talha Ahsan and other British citizens detained without trial for years and facing unjust extradition to the US. Samira Quraishy reports for Ceasefire.